Vlog 299: Paid signup option on the Steemit homepage + Famous Polish streamer blows up Dlive + Weiss Rating. Yesterday the Steemit team released a new blogpost here. For people in the know this was always possible through certain services but it's now also being used by the homepage itself. here. I'm happy that there is now a fast-track procedure for users that don't want to wait to be verified and want to enjoy the steem blockchain straight away. The downside of-course is that it's not frictionless. It's a decent temporary solution until easy-signups are released and I'm glad it's there. I do expect some influx of new users soon. Biggers names are joining the blockchain and they have a lot of followers. Yesterday there was a Polish Streamer @rafonixofficial on Dlive for the first time and 16K people were watching him live according to the 'watching now' counter. The total view counter is currently: 91,716 here. To put it into perspective. My view counter for my stream last night is 85. They can make some big waves. I start the vlog with the new Weiss rating report. Bitcoin, Bitshares, Cardano, Decred, EOS, Ethereum, Iota, NEM, ONTology, NEO, Ripple, Steem, Stellar, Zilliqa = B's. This is the best part of this blockchain, you only need one single killer app built on top of it to be successful and the whole Steem community will benefit from it...there are a lot of promising apps out there already, and if you add smart media tokens this starts to become mind blowing. I´m getting addicted to your vlog. It´is like an injection of enthusiasm for the times ahead. Thank you. Paid sign up option has its advantages and disadvantages. The good thing is it will fasten sign up process which will increase steemit comunity at much faster rate. On the other side I already saw so many people with multiple accounts, not only two, but 4,5,6..8...! This concerns me. I would rather have fewer reliable members than thousands of spammers. But that’s just me. I noticed Steem is under pressure a bit. Are we heading to your buy point? 😆...Thank you for Steemify, you are doing a great work here. I’m voting for you guys as a witness. Those DLive numbers are mind boggling. Great that the platform didn't collapse though, under their weight! Amazing option, I think everybody will agree with this, because it's a matter of opportunity cost... if you want to start your journey fast, you pay an amount, or wait some time which might cost you even more money (indirectly). Even on twitch, having 10K viewers is very good, obviously on Dlive, or anywhere on STEEM blockchain, someone with such a big follower base immediately erases our relevance. Thanks for letting us know about the live streamer, I totally missed that! I think the comparison you made was very interesting: You may not have as many viewers, but in terms of earnings you are actually ahead of him (unless he streams every day from now on and gets supported by whales) and also in terms of Steem Power you are way ahead. The word is soon. This kind of tipping point seems certain. Many changes are coming. I hope the resulting wave of popularity does not wash us little people away. I think applications build on top of the STEEM blockchain have a bigger change to bring in the masses than steemit.com. And that's a good thing. This is so wounderful great work steem team . Keep good work . I resteem your post on my blog . I was met with so much excitement on my face just this morning when I was trying to teach a friend of mine how to register on the platform. Last week, I tried opening an account for a friend and up till today he hasn't received the code that was meant to be sent to his phone. He became discouraged and now is no longer interested in steemit. This morning I tried on boarding another friend, only to discover that we now have new options and I was happy. Even if it means paying 5 steem for a new account, ibwouodnt mind because I know he would make much more when he starts blogging. This is really a good move though temporary until the next hardwork looks into the issue of delays registration. You can also try using Steeminvite.com by @pharesim. I used it a couple of times and it works flawlessly and you don't have to pay a lot for an account at all. Just 0.1 SP and delegate as much SP as you need. After the invited person has earned rewards you can undelegate SP. I didn't know about this. Thanks for this link! Przecież podał link do Rafonixa. Sadly no 'A' this week. I expected this cryptos to make great grade on weiss. Lol! D live will the valuable as times goes on, the most amazing is that they are no annoying ads when enjoying the film. D live will be the value as times goes on, the most amazing is that they are no annoying ads when enjoying the film. how much this "count viewer" is in real $$$ today?? Well easy access by paying for now sounds great and I guess it will work pretty nicely for now. While as the popularity of Steem Blockchain is getting in the future many new users of great popularity will be getting in here.Which is indeed great for all of us. who are blockbrothers for the steem blockchain? Thanks a lot sharing this valuable post..
Wow! 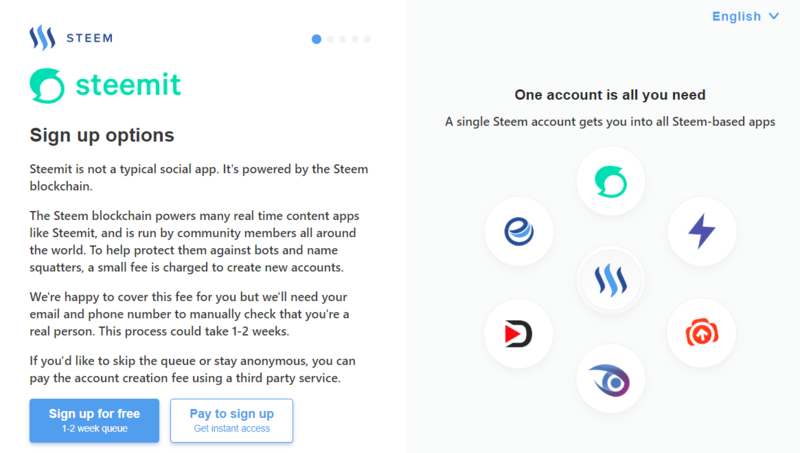 Such a massive publicity of steem. I'm really excited about this platform. Wow, that is sick! So many views by @rafonixofficial. Such social media maniacs can really make Dlive and Steemit very popular. Well this is quite a change, seem like I got in just in time before the changes, I am now sure this platform is going to give youtube a run for their money! Love to watch your vlog. I want to learned some tips. I am new on this. Thanks for sharing. @exyle Yeah I went to go help sign a friend up and saw that new speed up option. The only thing I’ll say is this was a friend who is totally new to crypto in general and owns nothing thus far so he just opted for the long drawn out process as he “didn’t want to be bothered” with buying Steem and all that. I wish there was still a friendlier option for those new to the world of crypto as a whole but I’m sure I’m time these issues will be rectified.